YayPay offers unparalleled visibility in AR processes for finance teams. 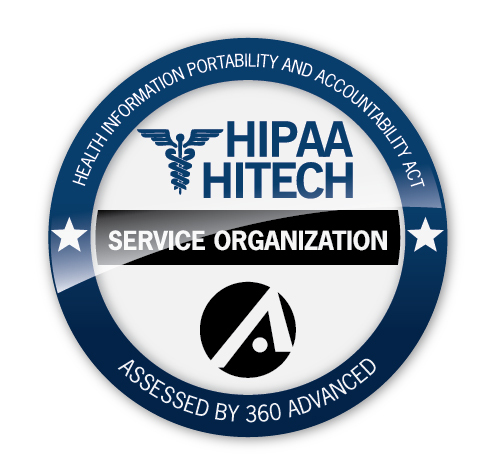 The YayPay dashboard offers an easy-to-understand view of outstanding invoices and deep insights into your overall AR health and payor trends so that you can exceed your collection targets. YayPay directs your accounts receivable staff to focus on the highest priority accounts based on our predictive algorithms. Prioritization has never been easier. Superior AR management begins with the payor's credit risk assessment and historical payment behavior; Yaypay delivers a comprehensive reporting and automated task generation tool that enhances the account receivables credit and collections process. YayPay is a single point of record for all payor information. YayPay integrates discrete payor information from client ERP/CRM and external data sources, and updates in real time, so your business will always have the latest information. Easily automate manual collection tasks, including payment reminders, internal escalations, and more. Accomplish more each day without increasing your workload. You are able to view your invoice in our customer statement portal and immediately make a payment, drastically reducing your DSO. 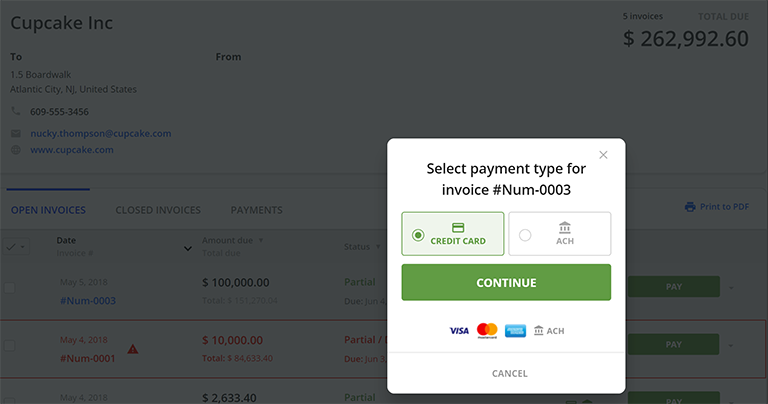 In addition to streamlining collections management, YayPay provides the ability for your customers to easily pay their invoices through our modern and secure customer statement portal. Your customers can access the portal through a statement link and select the invoices to be paid by either credit card or ACH. 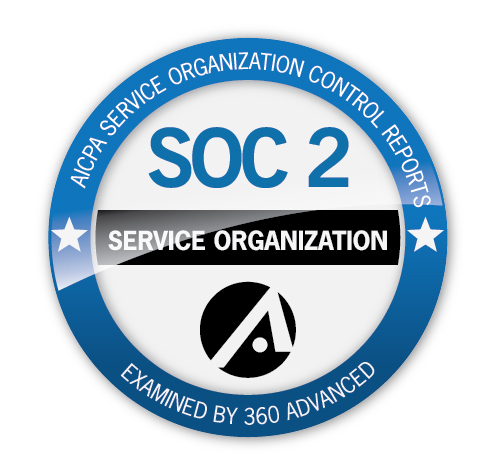 Communication history makes it easier for users to monitor and follow up on outstanding receivables. YayPay did exactly what we needed … we’ve saved time, saved resources, and improved collections at the same time." YayPay is helping us save a lot of time. In addition, YayPay’s payment forecast is bringing a degree of precision that is hard to replicate using manual calculations." Going with YayPay solved all of our issues around automating customer outreach and communicating internally with our sales team. Our sales team did not have easy access to financial data and YayPay solved that problem." What ERP, Billing and CRM integrations does YayPay currently support? 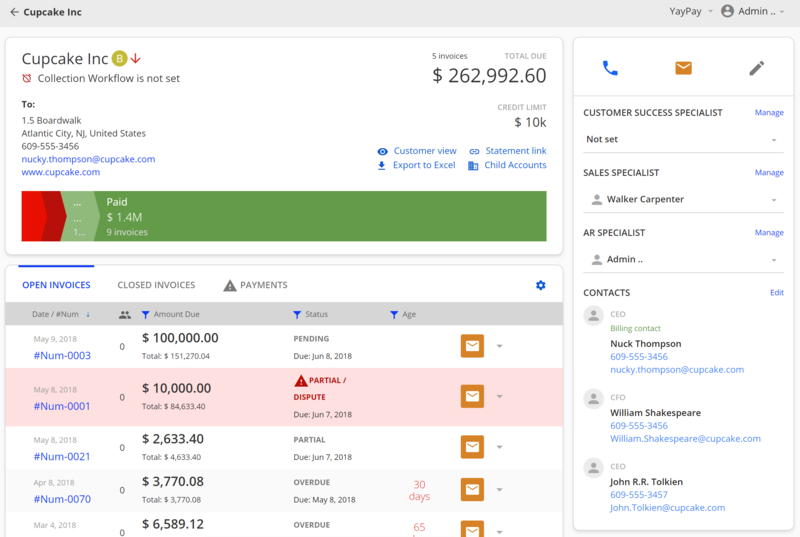 YayPay integrates into industry leading ERP and Billing solutions such as Oracle NetSuite, Sage Intacct, Acumatica, QuickBooks Online (QBO), Zuora, Recurly, Enmark Systems, Plex, and Salesforce. We will continue to add integrations over time. Does YayPay integrate into my ERP to pull the invoice, billing, and vendor contact details and what is that data used for? Yes – YayPay pulls over all invoice detail (customer data, open/closed invoices, payments, and billing contacts) through our seamless integration, and YayPay automates follow-up on your AR process using your invoice due dates. We provide in depth analytics on your AR process to quantify how YayPay is improving your collection times and DSO. By uploading billing contacts from the source ERP/Billing system to YayPay, we provide our users with CRM functionality to log and track all customer communication. Can we integrate into an ERP or Billing solution that is not currently supported by YayPay? Absolutely. YayPay has a REST API that exposes the most commonly used capabilities for interacting with YayPay. Invoices, credit memos, payments, customers, and contacts all sync directly from the source accounting or billing application. 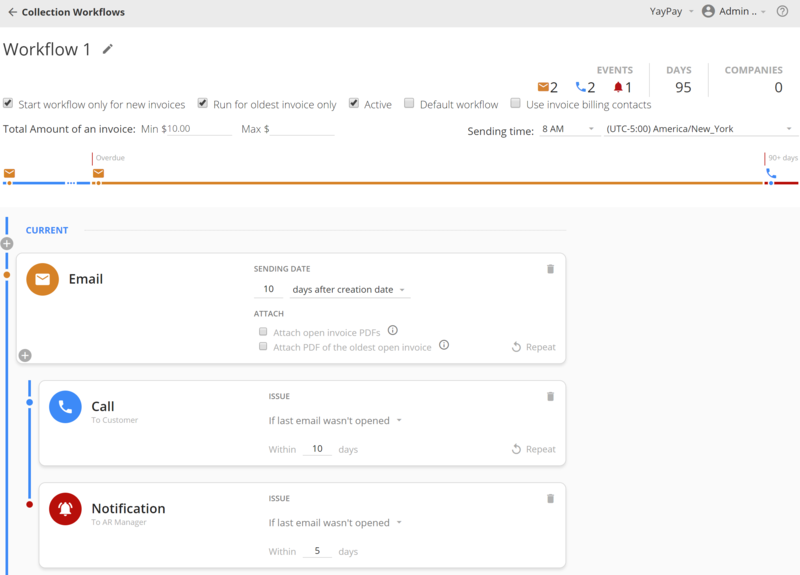 This allows the business to seamlessly connect all business applications and CRM technologies to provide a unified collection automation experience for the customer. YayPay’s main dashboard provides you with a complete overview of your AR situation. Does YayPay provide any capabilities around facilitating payments via credit card or ACH? Yes. YayPay provides the ability for your customer to pay their invoices through our customer statement portal. Your customers can access the portal through a statement link and select the invoices they want to pay and then select their payment method (credit card or ACH). 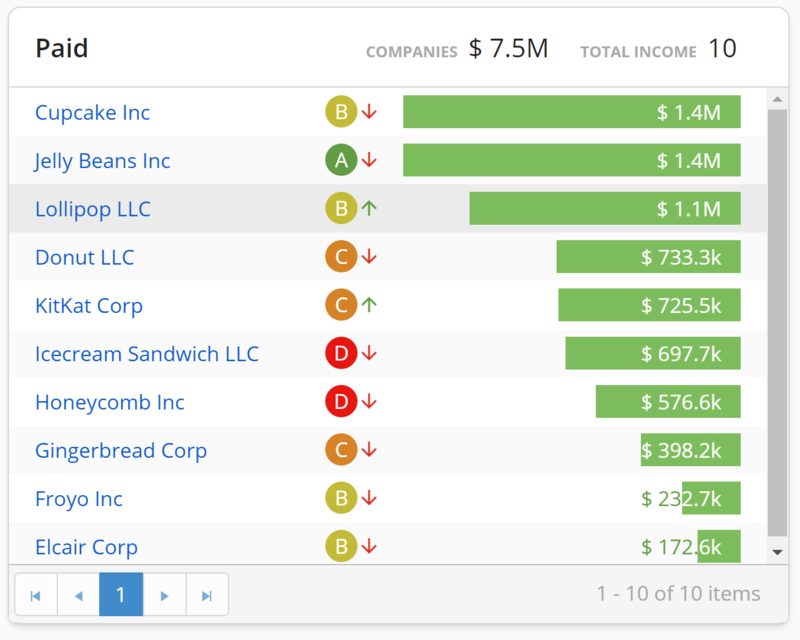 Through the customer statement portal, your customers can see what is happening with their accounts at a glance. 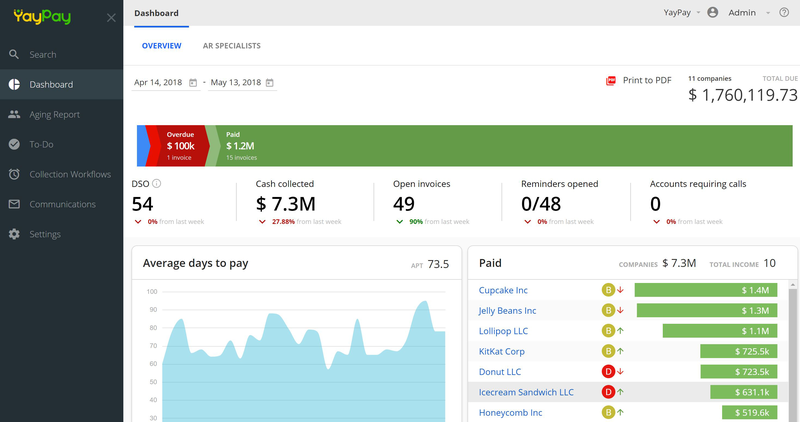 On top of making credit card or ACH payments to their open balance, the statement portal allows them visibility on outstanding invoices and what payments have been applied to closed invoices. How would YayPay interact with our CRM system? YayPay pulls AR information from your accounting, ERP, billing, and CRM applications and consolidates it all in one place. 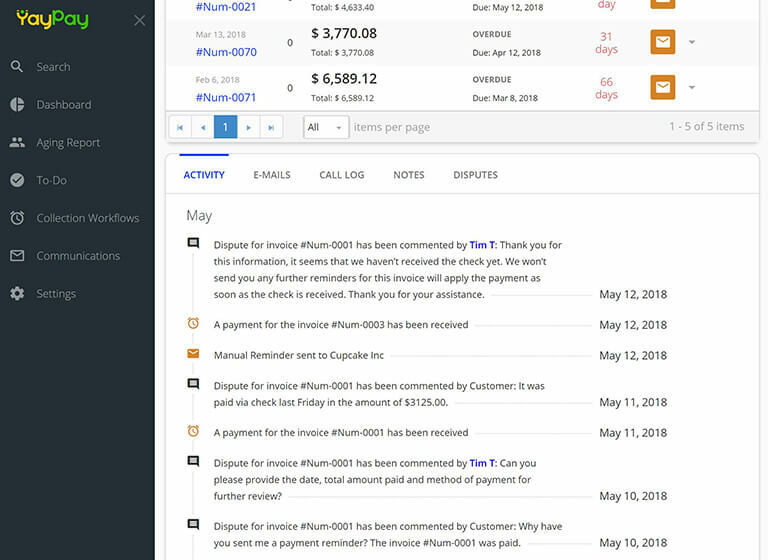 Within YayPay you can log calls, make notes and track activity in detail. Everyone is on the same page – you and your team can communicate easily. Automated notifications allow you to keep everyone on track, turning your AR team into your Customer Success team! What is a collection workflow? Simply put, collection workflow is a communication tool that automatically sends correspondence to your customers based on the credit and collections stage of the invoice (current, soon to be due, overdue). It can also be leveraged to send internal correspondence as well, keeping stakeholders in the loop on the AR collection process. What are the cash prediction capabilities within YayPay? Would you like to know when your customer will be paying their outstanding invoices? How about knowing which of your customer accounts to focus on, allowing you to be more productive with your day? Knowing the likelihood of ‘when’ a given invoice will be paid by your customer has typically been unknown, until now. YayPay leverages cutting edge machine learning technology that allows you to better predict payment behavior. Accurately predicting payment behavior allows collectors to focus on those accounts that are potentially at risk. Also, being able to predict ‘when’ a payment will be received improves AR cash forecast accuracy and transparency. We currently serve companies in multiple countries outside of the U.S.
Get more accurate cash flow predictions with automated accounts receivable.